I watched Midnight in Paris yesterday. 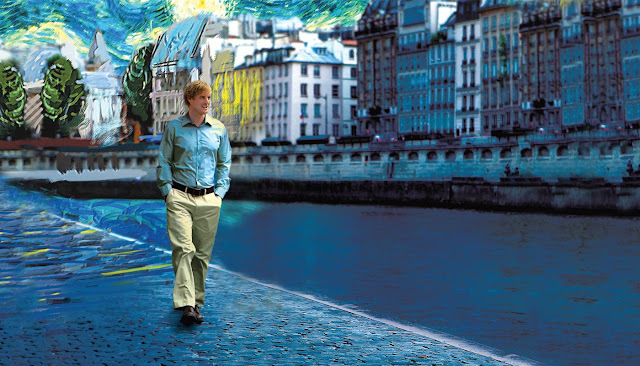 Woody Allen has made Paris look oh so beootifool and oh so romantique. Not quite how I remember Paris. Maybe because I was busy stuffing my face with cheese and chocolate and for some reason salmon. The movie was lovely. Weird too. But lovely. (Don't read the next paragraph unless you've already watched the movie. I hate when people tell you the story and kill it for you). Owen Wilson - (a screenwriter engaged to Rachel McAdams) gets transported every night at Midnight to Paris in the 20's. A time he felt was the Golden Age. He meets Dali and Hemingway and Picasso and so many others. He can't believe how lucky he is. And when he explains the fact that he's from the future while having a drink with a few surrealists, they don't see anything wrong in it. They understand strange. He falls in love with Adriana - Picasso's lover/ muse. She takes him back to la Belle Époque - what according to her was Paris' Golden Age. Here they meet Gaugin, Degas and they think the Renaissance was the Golden Age. They probably fantasize about having a chat with Michelangelo and Da Vinci. After a few crazy nights of time traveling, parties and finding love, Owen Wilson decides to part ways with Adriana and live in the present. Where he instantaneously finds love. Good enough to forget his fiancé who he ditched minutes earlier. And this love loves Paris in the rain too. It was just the most beautiful story and the movie had a real Woody Allen feel to it. The credits roll in the strangest way as they do in most of his films which to me end up looking like TV movies. But then there were minutes of nothing but music and the beauty that is Paris. (If you're wondering who the museum girl is - it's Carla Bruni. And the French girl who loves Paris in the rain is the assassin from MI4. Where would I like to be transported to? Would I be excited/ overwhelmed/ intimidated/ would I burst with creativity in their company? But, maybe I should stop rhyming and just live in the present. Or just forget all that and go to sleep and have my dreams directed by Woody Allen. Because besides ice cream nothing in life should be vanilla.